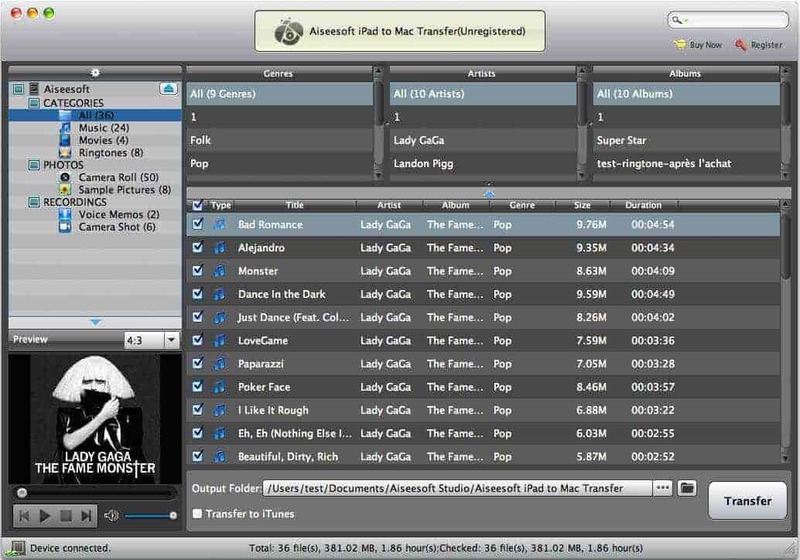 Aiseesoft iPad to Mac Transfer is specially developed for Mac users to transfer the files on their iPad to the Mac local disk. iPad files such as music, movie, camera roll can be transfered with zero quality loss. Plus it also can be used to copy iPad files to iTunes with no sweat. What is more, it works well with iPhone 5s and iPhone 5c. Besides, it supports the latest iOS 7 and iTunes. It is a few clicks away to tranfer iPad music, movies, TV shows, podcast, iTunes U, ePub, PDF, audio books, camera roll, picture, voice memos and camera shot to Mac. Backing up iPad files to iTunes is also as easy as pie for Mac users. This iPad to Mac Transfer supports all versions of iPhone, iPad, iPod, iPod classic, iPod nano, iPod shuffle, iPod touch, etc. So it also can be used to tranfer iPhone SMS (MMS) and Contacts to Mac. Search function enables you to quickly find files you need in categories of Genre, Artist, Album. Its distinct interface makes it much easier to finish your transfer and read the imformation of your files. And the transfer speed is also beyond your thought.